Ten years ago today a rag-tag group of people from across the spectrum of society gathered to do what groups of people do, watch a movie. Conveniently, this rag-tag group was watching a rag-tag group on film and, as rag-tag groups on film are prone to do, they were in the process of saving the world. Ten years ago I spent a summer working as a cook, and living, on Mount Mitchell in North Carolina. I was, at the time, still a Florida-boy. The cooks and wait-staff of Mount Mitchell State Park Restaurant were comprised of high-school and college students, veterans of the restaurant craft, and even an adjunct professor, and almost all of the staff lived in a small barrack off to the side of the restaurant with no communication with the outside world. We grew to be a family, and outings were never solo affairs. On the night of Wednesday, 1 July 1998, the entire group made the hour drive down the mountain in order to see a late showing of Armageddon on its opening day. Like the film we had our geniuses with no room for errors, goofballs who knew how to get it right, determined veterans, and eager rookies, and I don’t know one of us who would have traded that summer, or that night, for anything. 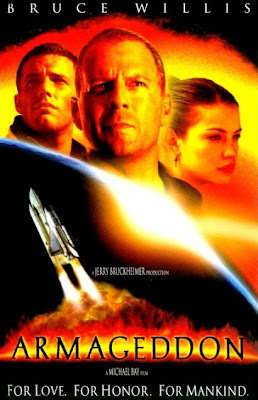 Armageddon’s roots lie in a screenplay that was drafted by Robert Roy Pool (who also wrote Outbreak), and as Armageddon came to realize its full-potential, it would seamlessly combine science fiction with science fact and breathtaking action with heart-breaking humanity. 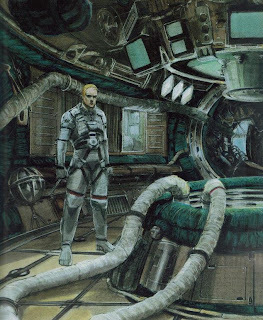 Between the nuclear devices, NASA training facilities (Ben Affleck did indeed get into the neutral buoyancy tank with seven true astronauts, including Shannon Lucid), the dangers of an oil rig, and fly-overs it is easy to get lost in the heroics and epic nature of this film, as evident in the words of William Fitchner, Armageddon’s Colonel Sharp, “I’ve been on the asteroid, I’ve been on the space station when it was spinning in circles and it was blowing up and they were throwing tree sap on the back of my head because the flames were going right by me – this thing got wild!” Yet, at its heart Armageddon is a story that played on themes central in all of our lives: mortality, family, and love. These three subjects collide head-long into each other throughout the movie, but never more so than when Harry Stamper decides to remain behind in place of A.J., so that A.J. may return home to his fiancée, Grace, who also happens to be Harry’s daughter. It is in these few moments of film that the sweeping vistas of space, the slick spacecraft, and the heart-pounding explosions all fade away and we are reminded of what makes us all truly human, our experiences with one another. Armageddon would garner just over 36 million in its opening weekend before moving on to secure 201 million domestically. It would also capture four Academy Award nominations in the categories of Best Effects: Visual Effects, Best Effects: Sound Effects Editing, Best Sound, and Best Music: Original Song (for Aerosmith’s I Don’t Want to Miss a Thing). 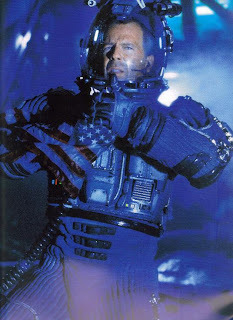 A model of the Summer Movie Blockbuster, Armageddon had something for every viewer and left us all, those in the theater from Mount Mitchell that night and those who saw the movie around the world, holding onto our loved ones a little more firmly with a little more fierceness in our hearts. This article is dedicated to Reida, Slinky, Chris, Andrew, Patrick, Jessica, Zak, Michelle (I still think of you every time I hear I Don’t Want To Miss A Thing), and my cousin Alexandra, without her I would have never found Mount Mitchell and discovered so many things about myself. Great Post! I love Mount Mitchell. I can not imagine what it would be like to live on the mountain for a Summer. Awe, cuz. That really was the best summer of my life. How you remember all this stuff is really beyond me! I do remember seeing the film, of course, but I never would have remembered it without reading this post! Thank you--once again--for being the keeper of our memories! Oh, and by "discovered things about myself," do you mean "got really, really drunk"? Hee hee hee.